BAD POINTS: Size, weight, old petrol engine is underpowered and thirsty. Tyres, running costs expensive. RATING: Three (out of five). established reputation of its predecessors. drivers, a sense of greater safety. spacious alternative to a Commodore or Volvo wagon. implied and was superbly finished. which performed only modestly but consumed fuel dramatically. A five-speed manual transmission was standard and a four-speed overdrive automatic was a popular option. little more than half the price of a Range Rover. a high centre of gravity and its serious off-road suspension deny it the agility and subtlety of a sedan. more daunting than mount an occasional kerb. are rare; a sensor in the electronic fuel-injection can give trouble on early examples of this model. twin-cam six that brought new standards of performance and fuel economy. economy for so heavy and blunt-shaped a vehicle with lively performance. higher. Some owners found themselves forking out for new front pads every 10,000 km at $140 a time. sufficient for the Cruiser's weight. By 100,000 km, the inner axle seals will likely need replacing, at a cost of $400. 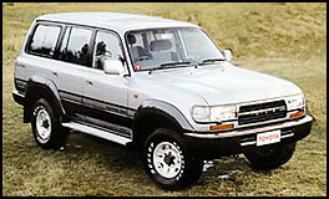 Land-Cruiser buyers have had whole new worlds opened up to them. Manual gearbox - Check for wear on synchronmesh. Chassis and under body - Check for signs of hard off-road use. Brake pads - May last 10,000km. Can wear out quickly on automatic models. Inner axles - Seals wear out by about 100,000km; $400 to replace.